Fans of the BBC’s searches for West End stars in recent years will no doubt be glued to their TV screens every weekend to see who is chosen from the 10 remaining girls to play Dorothy in Sir Andrew Lloyd Webber’s production of the Wizard of Oz in ‘Over the Rainbow‘. Last Sunday saw the first girl voted off from the live shows, 22 year old Amy Diamond from Cheshire. 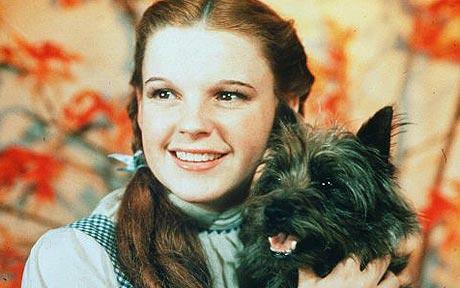 This weekend however the search steps up for a Dorothy, and also for a Toto. The BBC is looking for a dog to play Dorothy’s little black dog Toto in a one off gala performance, and unlike in the book and the film, any dog breed is being considered. It doesn’t matter if your dog is a little Shih Tzu or a giant Great Dane – they could be Toto. To help promote their search, the BBC has made this special doggy version of The Wizard of Oz, starring nothing but dogs (except of course for the evil Wicked Witch of the West, who is a cat, with her flying cat monkeys). If you think your dog has what it takes to be Toto – visit the BBC website and find out how to audition.